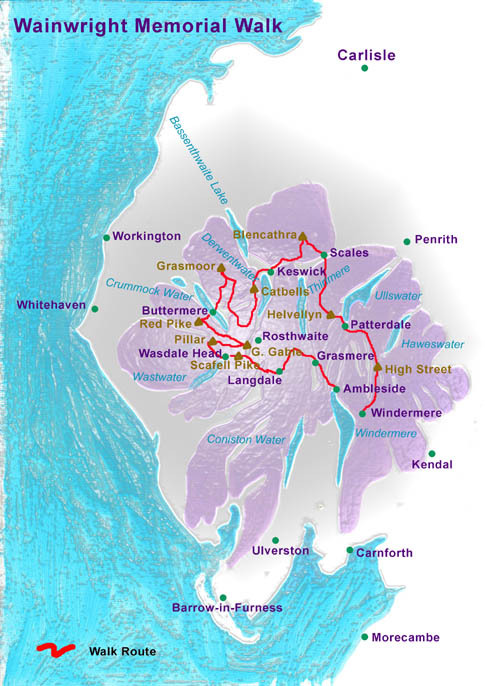 In 1931 Alfred Wainwright, along with 3 friends from the Blackburn Borough Treasurer's Office where he worked, set off on a 'Grand Tour' of the Lake District which he designed to "lead the walker everywhere worth mentioning in the Lake District", on a route devised to make sure that "every lake, every valley, every mountain, will be seen if not actually visited". Wainwright planned his 'Grand Tour' as a 6 day walk but conceded that it required at least an extra day and indeed, even over 7 days this is still an ambitious project for the fit walker. We offer 'The Wainwright Memorial Walk' over 7, 8, 9, or 11 days and most walkers will find one of these itineraries will suit their level of fitness or ambition. Wainwright planned his 'Grand Tour' as a 6 day walk but conceded that it required an extra day. Even over 7 days, a high level of fitness is required but this itinerary is likely to be relished by those who enjoy long days striding out over ridge-tops. Arriving in Windermere you check into your accommodation. If you have time, it is well worth the short walk to nearby Bowness on the Lakeside. 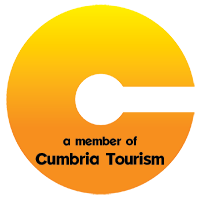 There are several pleasant restaurants, cafes and pubs in Windermere and Bowness. The first leg of the Wainwright Memorial Walk walk starts with a climb out of Windermere to Orrest Head where a young Wainwright first set eyes on the Lake District. From here the route climbs the ridge above Kentmere as you begin a spectacular 'roller coaster' ride over the summits of Yoke, Ill Bell and Froswick to the summit of Thornthwaite Crag. You continue on a Roman Road across the summit of High Street before descending past Angle Tarn to Patterdale at the southern end of Ullswater. 15 miles. 4339ft. ascent / 4196ft. descent. From Patterdale you climb above the Grisedale Valley to the start of one of the finest ridges in the Lake District, Striding Edge. This deliciously exposed rock arete above Red Tarn is sensational and looks scary but its bark is worse than its bite. In strong winds it may be best to follow the path below the Tarn and ascend Helvellyn by the less exposed Swirrel Edge. From Helvellyn's summit the route strikes north staying at a high level as you traverse Raise and a collection of Dodds to reach the sudden termination of the ridge at Clough Head. A descent from here following Mosedale Beck brings you to the tiny hamlet of Scales. 14.8 miles. 4710ft. ascent / 4454ft. descent. A steeply rising traverse across the hillside above Scales leads to a ridge overlooking Mousethwaite Comb and climbs to the picturesque Scales Tarn. From the usually dark waters of the tarn you can look up at the imposing skyline formed by Sharp Edge. This is the way the Wainwright Memorial Walk goes if you dare. Sharp Edge offers considerably more exposure than Striding Edge and if courage fails you here, or if the wind is blowing strongly, you are advised to take the easier safe track on the opposite side of the cwm which rises across Scales Fell to the summit ridge. By either route you will then have a short walk up to the summit for fabulous views. The descent is direct from the summit via Halls Fell, another superb ridge - not as sharp as Sharp Edge but still requiring care .Reaching Threlkeld it will probably be hard to resist some refreshment before continuing to Keswick. 8.5 miles. 2698ft. ascent / 3171ft. descent. This is the longest leg of the route and an early start is recommended. Today begins with a traverse of the western bounding ridge of the Borrowdale Valley over Catbells, Maiden Moor and High Spy with super views over Derwentwater on one side and the deep vale of Newlands on the other. A steep descent followed by a long climb brings you to Dale Head and from here an excellent stride out along Littledale Edge takes you next to the summit of Robinson. From here you descend to Newlands Hause which carries the road from Stair to Buttermere. Crossing the road you now climb up over Knott Rigg to Ard Crags and on to Eel Crags. At this point Wainwright made a detour to take in the summit of Grasmoor before dropping down the ridge over Wandope and Whiteless Pike to reach your accommodation in Buttermere, a very welcome sight. 18 miles. 7669ft. ascent / 7519ft. descent. Another big day with 8000 feet of ascent! It starts with a steep ascent via Bleaberry Tarn to the summit of Red Pike. As you might expect from a route designed by Wainwright, there are many fine ridge walks on the Memorial Walk but this is one of the finest. The views over the Buttermere Valley and back to Crummock Water and Low Water are among the best in Lakeland. Crossing the summits of High Stile and High Crag you drop to Scarth Gap before climbing again to Haystacks, one of Wainwright's favourite peaks and the place he chose as his last resting place. You pass Inominate Tarn where his ashes were scattered and make a steady climb to Brandreth. From here you have a strenuous roller coaster ride over Green Gable and Great Gable. From the summit of Great Gable you drop down to a col before climbing to the next top, Kirk Fell. From Kirk Fell you drop to the Black Sail Pass and then climb steadily up the ridge to Pillar. Wainwright took a detour here to walk along the Shamrock Traverse and climb up beside Pillar Rock, but this is entirely optional. At the summit of Pillar you still have two summits to climb but first its down again to Wind Gap. The climb to Steeple goes quick and then you are on the second Red Pike of this long day. All that is left is a descent of the ridge to Dore Head and a scree run down to Mosedale Beck where hopefully your jelly legs will get you to the Wasdale Head Inn. 14.5 miles. 7947ft. ascent / 8085ft. descent. There are a couple of options for the ascent of Scafell Pike from Wasdale from the straightforward to the intricate. From the summit of England's highest peak you now walk along the ridge which curls around the head of Eskdale, passing over Esk Hause and Esk Pike to reach Bow Fell. Thus you have passed from Wasdale to Langdale without hardly noticing except for a little tiredness in the legs. But don't think about that because you have to traverse the Crinkle Crags and climb Gold Pike and the swashbuckling Pike O' Blisco before you can at last head down to the delights of the Dungeon Gyhll Inn. It is easily possible to shorten today's walk with a direct descent to Langdale from Bowfell or make it shorter still descending from Esk Hause via Angle Tarn and Rosset Gill. 11.6 miles. 5449ft. ascent / 5389ft. descent. Another sensational mountain day begins with an ascent of the ridge above Dungeon Ghyll to Pike o' Stickle. You cross over to the other Langdale Pike, Harrison Stickle before striking out north over Thunacar Knott and on to High Raise. Now descending Greenup Edge, you cross to the head of Far Easedale before following a splendid ridge line over Calf Crag and Gibson Knott to reach Helm Crag above Grasmere. A final steep descent brings you to this quintessential Lakeland Village which was the adopted home of William Wordsworth. The hard work is nearly over but there remains the not insignificant matter of the climb up the Red Bank to the start of the Loughrigg Terrace which along with the old road into Ambleside following the fall of the River Rothay, is a simply delightful way to end an epic tour of the Lake District. 14 miles. 3809ft ascent / 3934ft descent. This itinerary splits the walk into 8 stages and spends two nights in the beautiful Buttermere Valley, which also affords a respite from moving on each day. Even over 8 stages, this is still a challenging schedule. Today begins with a traverse of the western bounding ridge of the Borrowdale Valley over Catbells, Maiden Moor and High Spy with super views over Derwentwater on one side and the deep vale of Newlands on the other. A steep descent from the lofty summit of High Spy followed by a long climb, brings you eventually to Dale Head and from here an excellent stride out along Littledale Edge takes you next to the summit of Robinson. From Robinson you descend to Newlands Hause (hause = pass), which carries the road from Stair to Buttermere. Turn left and follow the road steeply downhill to reach the tiny village of Buttermere where you will check into your accommodation for the next two nights. 11.7 miles. 4224ft. ascent / 4053ft. descent. After a fortifying breakfast you are ready to continue the Memorial Walk, starting by climbing back up the road for 1.5 miles to the point you reached yesterday. Now climb up over grassy hillside to the top of Knott Rigg and continue to Ard Crags. Cross an expanse of moorland and over the whale-back ridge of Sail to reach Eel Crags. Today's prize is the summit of Grasmoor, a giant of a a fell. Having taken in the summit view you retrace your steps as far as the head of Addacomb before climbing gently to the viewpoint cairn on the top of Wandope. The narrow ridge of Whiteless Edge leads to a saddle and climb up to Whiteless Pike. At this point, the majority of the day's exertions are over and all that remains is a simple descent back to Buttermere and your accommodation. 8.5 miles. 4172ft. ascent / descent. This is not the longest day (in miles) but it will certainly feel like it with 8000 feet of ascent! It starts with a steep ascent via Bleaberry Tarn to the summit of Red Pike. As you might expect from a route designed by Wainwright, there are many fine ridge walks on the Memorial Walk but this is one of the finest. The views over the Buttermere Valley and back to Crummock Water and Low Water are among the best in Lakeland. Crossing the summits of High Stile and High Crag you drop to Scarth Gap before climbing again to Haystacks, one of Wainwright's favourite peaks and the place he chose as his last resting place. You pass Inominate Tarn where his ashes were scattered and make a steady climb to Brandreth. From here you have a strenuous roller coaster ride over Green Gable and Great Gable. From the summit of Great Gable you drop down to a col before climbing to the next top, Kirk Fell. From Kirk Fell you drop to the Black Sail Pass and then climb steadily up the ridge to Pillar. Wainwright took a detour here to walk along the Shamrock Traverse and climb up beside Pillar Rock, but this is entirely optional. At the summit of Pillar you still have two summits to climb but first its down again to Wind Gap. The climb to Steeple goes quick and then you are on the second Red Pike of this long day. All that is left is a descent of the ridge to Dore Head and a scree run down to Mosedale Beck where hopefully your jelly legs will get you to the Wasdale Head Inn. This itinerary splits the walk into 9 stages and spends two nights in the beautiful Buttermere Valley and two nights in the remote Wasdale Valley. This will be a good option for most fell walkers who are used to days of maximum 8 hours. Day 2: Patterdale to Scales This is the longest (but not necessarily the hardest) day of the tour. From Patterdale you climb above the Grisedale Valley to the start of one of the finest ridges in the Lake District, Striding Edge. This deliciously exposed rock arete above Red Tarn is sensational and looks scary but its bark is worse than its bite. In strong winds it may be best to follow the path below the Tarn and ascend Helvellyn by the less exposed Swirrel Edge. From Helvellyn's summit the route strikes north staying at a high level as you traverse Raise and a collection of Dodds to reach the sudden termination of the ridge at Clough Head. A descent from here following Mosedale Beck brings you to the tiny hamlet of Scales. Today begins with a steep ascent via Bleaberry Tarn to the summit of Red Pike. As you might expect from a route designed by Wainwright, here are many fine ridge walks on the Memorial Walk but this is one of the finest. The views over the Buttermere Valley and back to Crummock Water and Low Water are among the best in Lakeland. Crossing the summits of High Stile and High Crag you drop to Scarth Gap before climbing again to Haystacks, one of Wainwright's favourite peaks and the place he chose as his last resting place. You pass Inominate Tarn where his ashes were scattered and make a steady climb to Brandreth. From here you have a strenuous roller coaster ride over Green Gable and Great Gable. From the summit of Great Gable you drop down to Beck Head which is a saddle between Great Gable and Kirk Fell. Here you tun left and drop steeply down beside Gable Beck to its junction with Lingmell Beck in the main valley. At this point you follow the path known as Moses Trod which leads to Wasdale Head and your accommodation for the next two nights. 9.5 miles. 5033ft. ascent / 5173ft. descent. From Wasdale head you start by retracing your descent route to Beck Head. Arriving at the saddle you turn left and climb to the summit of Kirk Fell. At the summit cairn you turn to the north and descend to Black Sail Pass, a saddle between Kirk Fell and Pillar. Climbing steadily up the ridge you pass a minor top marked on the OS map as' Cloven Stone'. Just beyond here, Wainwright took a detour to walk along the Shamrock Traverse and climb up beside Pillar Rock, but this is entirely optional. At the summit of Pillar you still have two summits to climb, but first it's down again to Wind Gap. The climb to Steeple goes quick and then you are on another Red Pike.. All that is left for today's walk is a descent of the ridge to Dore Head and a scree run down to Mosedale Beck where you pick up a good path back to the Wasdale Head Inn. 8.3 miles. 4453ft. ascent / descent. This itinerary splits the walk into 11 stages and brings this magical tour de force within the realms of the mere mortal fell-walker. On this itinerary you will spend two nights in Buttermere, Wasdale and Langdale which in each case also provides a welcome respite from constantly changing hotel. From Patterdale you climb above the Grisedale Valley to the start of one of the finest ridges in the Lake District, Striding Edge. This deliciously exposed rock arete above Red Tarn is sensational and looks scary but its bark is worse than its bite. In strong winds it may be best to follow the path below the Tarn and ascend Helvellyn by the less exposed Swirrel Edge. From Helvellyn's summit the route strikes north staying at a high level as you climb steadily to the summit of Raise. Descending to the North you reach Sticks Pass where you turn west and follow the path down to the road at St John's-in-the-the-Vale. 7.8 miles. 3349ft. ascent / 3303ft. descent. Climbing back up to the Sticks Pass you now turn North and ascend Watson's Dodd followed by Great Dodd and Little Dodd. Striding out along the watershed between St John's and Ullswater you traverse Calfhow Pike before climbing to the termination of the ridge at Clough Head. A descent from here following Mosedale Beck brings you to the tiny hamlet of Wallthwaite and up to the busy A66. On the other side of the road is Scales which marks the end of today's hike. 9.8 miles. 3314ft. ascent / 3110ft. descent. There are a couple of options for the ascent of Scafell Pike from Wasdale from the straightforward to the intricate. From the summit of England's highest peak you now walk along the ridge which curls around the head of Eskdale, passing over Esk Hause and Esk Pike to reach Bow Fell. Thus you have passed from Wasdale to Langdale without hardly noticing except for a little tiredness in the legs. From Bowfell you can at last head down the Band to the delights of the Dungeon Gyhll Inn. It is easily possible to shorten today's walk with a direct descent to Langdale from Bowfell or make it shorter still descending from Esk Hause via Angle Tarn and Rosset Gill. 8.6 miles. 4116ft. ascent / 4054ft. descent. After a re-ascent of the Band as far as the Three Tarns, you begin a superb traverse of Crinkle Crags to Cold Pike. Dropping down to Red Tarn, you now climb up to Pike O' Blisco before descending back into the Langdale Valley via Blake Rigg and the Redacre Gill to Wall End. 7.5 miles. 3366ft. ascent / descent. At the end of the walk it is a short (5 mile) journey from Ambleside to Windermere station. There are regular buses or we can arrange a taxi transfer for you. The 'Wainwright Memorial Walk' follows his original route starting from Windermere and ending in Ambleside. The route has some challenging sections including Striding Edge on Helvellyn and Sharp Edge on Blencathra (although this can be avoided if conditions are unfavourable). The list of Wainwright summits crossed is impressive and includes High Street, Helvellyn, Raise, Great Dod, Blencathra, Catbells, Maiden Moor, High spy, Dale Head, Robinson, Grasmoor, Red Pike, High Stile, Haystacks, Great Gable, Pillar, Steeple, Scafell Pike, Esk Pike, Bowfell, Langdale Pikes, High Raise and Helm Crag, among others. This is a tough and sustained walk for experienced fell-walkers.